For some Google Drawings is just a dumbed down version of Paint not allowing for much. However, the collaborative and constrained nature opens up so many different possibilities. This session will explore some of the different possibilities associated with Google Drawings from making collaborative brainstorms to developing complex flowcharts to creating engaging graphics. It will be jam packed with practical samples and examples. Aaron hopes to spur on new ideas and start the conversation about why you should start using Google Drawings more today. Often Google Drawings is overlooked as being a simple graphic program, offering not much more functionality than Microsoft Paint. You are able to add images, text, shapes, links and lines, while in regards to images, you can crop, re-colour and adjust the basic image settings. That means no touch-ups, no effects, no textures. However, what makes this more than Paint is the collaborative nature. The ability to easily share opens up many possibilities, whether it be working on a project, creating a brainstorm or just sharing a file to be remixed. In some respect the perceived limitations of Google Drawings are often its strengths. For example, there are some out there who use Drawings to create eye catching visuals. 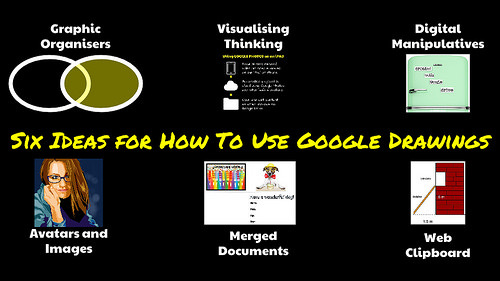 Bypassing the many applications, instead using Google Drawings to create infographics. Tony Vincent has made a fantastic video documenting how he did this to create an infographic associated with Periscope. Resize the canvas, either by manually dragging the edge at the bottom or in Page Setup within File to make something specific. Format shapes: This includes colour fill, as well as width and style of the border. Edit images, including cropping to a shape, adding borders, inserting links and adjusting the colour settings. Red and blue guidelines helps you to organise the different objects both in regards to alignment and size. Publish to the web, not only is this useful in its own accord, but it also provides the means to embed within a website. For a thorough step-by-step introduction to Google Drawings, I recommend looking at Kasey Bell’s Cheat Sheet. Holding SHIFT will allow you to make finer adjustments, constrain movement to the nearest axises and maintain relative proportions when resizing. Canvases are transparent, but will turn to white if you download them as a JPEG. If you want to change the background colour, right click on the canvas to get the different options. Use the workspace around the canvas to store elements and instructions offstage. Drawings provides the ability to create and collaboratively complete graphic organisers. This can be anything from a Venn diagram, to seating plan to a sporting line-up. Eric Curts has created a great collection of templates to easily copy into your Drive. By using shapes, lines and texts Drawings allows you to create brainstorms, concept maps, timelines, flowcharts and infographics with ease. What is good is that you can easily build upon past designs. Whether it be working with a fraction wall,, making messages with magnetic poetry, moving the hands of a clock to tell the time, or organising different shapes into categories, Drawings allows you to create resources that allow students to engage with. Using the line tool, create arrows to the different parts and then add text to describe them. This can be particularly useful when creating diagrams or annotating images for tutorials for Docs, Slides and Sheets. Using web clipboard, images can be created using Drawings then transferred to other programs. The benefit is that unlike copying a finished image, you are able to continue to make changes and adjustments. See Andy Hair’s course diagram for an example. Building on the idea of Web Clipboard, you can use the full suite of applications to create merges for any situation. Sylvia Duckworth provides a tutorial for how to quickly and easily create personalised cards. Through the use of shapes and lines, you are actually able to make a wide range of images. From cartoon characters and vector portraits, to visual quotes, memes and motivational posters. What is great is the ease in which you can just remix an old design. Create a Visual Quote: Use the ingredients provided to create your own visual quote. Design a Flowchart: Choose one of the ideas provided and create a flowchart describing how you could use it in your own classroom. Make your own Avatar. Using James Peterson’s tutorial as a guide, have a go at creating a new avatar by taking a picture and turning it into a vector image. An Introduction to Google Drawings by Aaron Davis is licensed under a Creative Commons Attribution-ShareAlike 4.0 International License.